#6 UP will play #3 BYU at Noon on Saturday in the Orleans Arena (unless BYU upsets GU tonight...then it will be UP against SMC). Pick your poison? Perhaps, but at least the BYU game will be noisy and the revenge will be sweet. If it's BYU, that probably drives up the scalper price for the ticket I need! Either team will likely be playing with a need to win it all to get in attitude. Otherwise, I think the WCC will be a one bid league. #6 UP plays the #3 SMC Gaels in Las Vegas. Pilots actually played well in stretches against SMC in both games, now they just need to play a complete game. "just". Wow, was that a great game, or what? UP vs. St. Mary's at noon on Saturday. 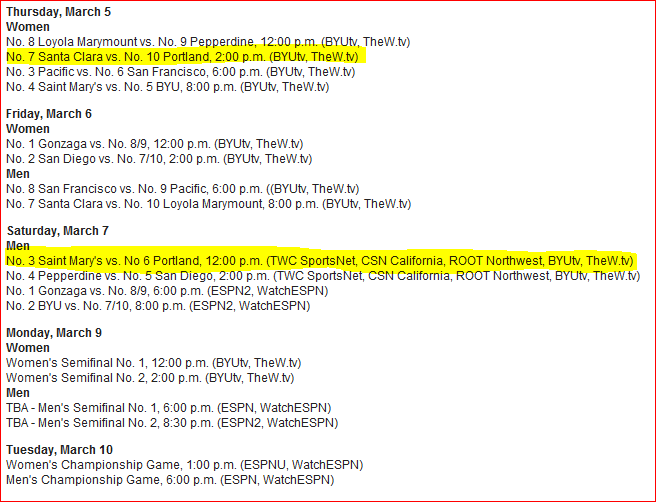 The game will be broadcast on ROOT and BYUtv, and streamed on TheW.tv. The Pilots played neck and neck with SMC just a week ago except for that 7 minute lapse that allowed the Gaels to score 18 straight points. UP can beat SMC....and luckily for some, the tickets will be less expensive. Possibly the most important question for next weekend: What's the line at the Orleans sports book on whether Mattywizz shows up to collect on his prize bucket of beers? Here is the information for the upcoming week! Early line from Kenpom - SMC by 7. PilotNut wrote: Possibly the most important question for next weekend: What's the line at the Orleans sports book on whether Mattywizz shows up to collect on his prize bucket of beers? What's his deadline? If I'm waiting and he doesn't show, can I call dibs? Hmmm, it sounds like we need an amendment to the bylaws to clarify. I think there should be a distribution of said bucket to the PN members in attendance. Lots of talk on their board about how GU has struggled recently against conference competition, and it's all the other WCC teams' fault because they are not good enough. Must be tourney time again. Can we schedule a sprint tri in Vegas to lure him in? pilotram wrote: Can we schedule a sprint tri in Vegas to lure him in? Yes, by all means the bylaws need to be amended.....how many years has it been now that the winner has not claimed the top prize? Speaking of Vegas, I'm just curious who all is going to be there? My wife and I will be staying at the Vdara and are getting in Friday and leaving Sunday. Can't wait to put some faces to names! I'll be there, staying within stumbling distance at the Orleans. I plan on attending the pre-game social on Saturday morning. For those of you familiar with the horseshoe shape of the Orleans Arena, the pre-game event will be at one of the far ends, or the tips of the U, at the same level you enter the arena, up the escalators from the main walkway to/from the casino (this is up from street level). Ask an usher or the ticket checker at the gate to point you to the correct side. Thank you to the U for using this location--I think it is better than previous locations, and when we move on to the semis, it will allow us to come and go from watching the other game. Great to see Riley back in uniform even though it was only for last night's 2015 Pilots Wally's at Franz Hall. I will be there, and will also be at the pre-game social. Those socials a couple years ago outdoors in the parking lot with the cold wind were brutal. This year sounds much improved. So, do we wear our Pilot Nation t-shirts, or have a secret ear tug or nose gesture? I thought the WCC All-Conference Team might be announced today. Since it wasn't, I'll prognosticate. I'd love to see others' predictions. Last year there was a 10-member "All Conference Team," and also 10 honorable mentions. I like the thinking with the conference picks but I think they changed the format this year. Maybe DD has the scoop. Team is getting ready for SMC. @CoachReveno wrote: Very good practice. Trying some creative things to continue learning and keep it fresh. Even worked on coming out of half with great energy! pilotdad1 wrote: I like the thinking with the conference picks but I think they changed the format this year. Maybe DD has the scoop. Can't say I disagree with those choices. I would not have put any other Pilots on the team, due to either missed injury time, or inconsistence performances. Our prognosticators had it mostly correct for first team. Biggest variances were not including Carter, and including Clark, who was only honorable mention. Bailey and van der Mars were also honorable mention. I cant argue with any of the results; I'm glad to see the WCC go back to an "All Freshman" team, instead of the "All Newcomer" team they had been using for a few years.